Lost Horizons, an exhibition by artist Letha Wilson that opens at Buffalo Arts Studio this Saturday, April 4, 7 - 10 p.m., includes artwork developed using a range of materials and techniques, from video to installation, photography to sculpture and collage. Several works have been created specifically for this exhibition, including a new video and a site-specific architectural structure. Issues related to travel, conservation, natural materials, and modern architecture and design are referenced in works that invite the viewer to participate in the journey. Wilson uses imagery from the outdoor environment in tandem with sculptural elements to create works that intertwine nature and modern architecture. 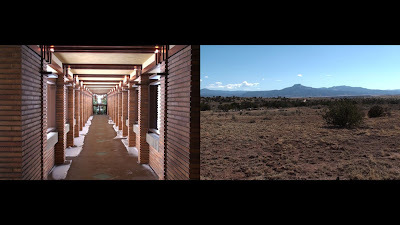 The two-channel video projection Double Buffalo Western mirrors walks through Buffalo Arts Studio and Frank Lloyd Wright’s nearby Darwin Martin House with walks taken in rural New Mexico. The architecture of the Buffalo spaces is used to guide walks out in the open wilderness. Inversely, walks taken in the Southwest using both the natural geography of the region and historical cliff dwellings are traced back in the gallery space. The video creates links between these different places, and gives the viewer the sense of being in two places at once. Similarities and differences between the two sites are brought to light, while not placing either site in a hierarchy over the other. 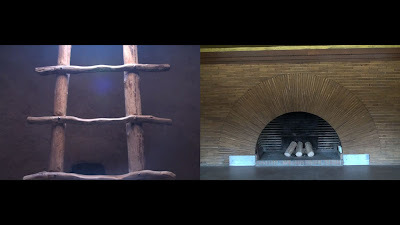 Of the video pieces in the exhibition, Wilson commented that "one walk mirrors the Martin House pergola with footage from Ghost Ranch, in New Mexico (where Georgia O'Keefe lived and worked for many years, actually the mountain in view she painted many times over), and the second image is linking a walk inside a circular kiva in a ancient cliff dwelling at Bandelier National Monument in New Mexico to the Martin House reception room." Don't miss this exhibition of intriguing work in a variety of media - inspired, in part, by the Martin House - at the nearby Buffalo Arts Studio (Tri-Main building), on view through May 22. Interpretive text and photos courtesy of the artist and Buffalo Arts Studio.